A hanging bird bath is a very nice addition to your garden and almost a must have for people who like to attract birds to their garden. We had several bird feeders in our yard and although we seen a lot of birds come and eat it from them, after adding a small hanging bird water feeder to the area the number increased drastically. It is a nice view from out kitchen window to see them take their bath and splash in the water. This made me realize that more people are maybe looking for a bird bath and decided to write some reviews of them. We opted for a large hanging bird feeder since we have a pretty large yard, but many of the brands and models we recommend here come in several sizes to choose from. I have seen this bird bath and found over 150 people who bought it and took the time to let us know what they thought about it. Overall they gave it a 4.3 star rating. It should hold about a quart of water and because it is shallow it is also easy to use for smaller birds. This bath is designed with the Tiffany stained glass in mind and it represents it very well. I have to apologize for the bad quality of the picture. I have replaced it several times but it is still a little blurry. I read that people found it was easy to clean with some warm water and that the finish prevents the forming of rust. The chain is strong enough to hold the bowl and the hook is very easy to attache to any branch or can be hung on a piece of wire if that is easier for your situation. The measurements are approximately 13..5 inches in diameter and the total height including the chain and hook is about 22 inches. The Whitehall company is one we have seen in our Weather vane reviews as a great company with a high standard for quality. The bowl is 15 inch wide and on the inside there is 12 inch room for water. The depth is about an 1.5 inch and this is shallow enough for even the smaller birds. The description mentions that this is a Copper Verdi finish what this means is that the material is aluminum with a copper finish and this should be safe to drink from for birds. After all when I grew up all we had were copper water lines and I did not hurt me. Again I have to apologize for the poor picture quality and will try to replace it with a better picture of this popular ceramic bird bath. Maybe a little lower rated with 4 starts but to be honest I could not really find to much reason for that. Maybe only that the holes for the chains were a little low and this made the water level also low. Some people mentioned it was because of that not deep enough for birds to take a bath. Some older buyers noted that the chain rusted fairly fast and that this was of course not a good thing. Most people however are very positive in their ratings and like this bird bath. 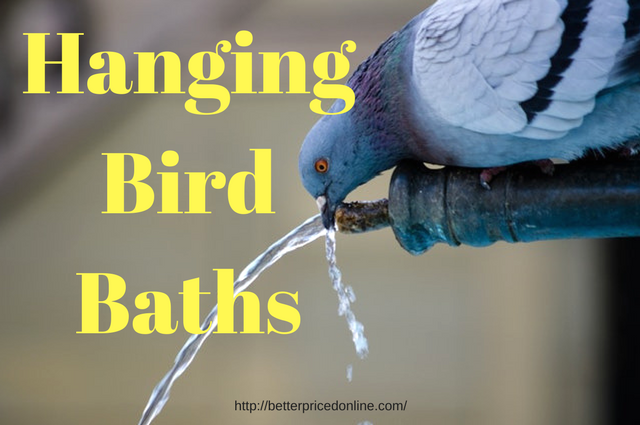 If you do not like to use it as a bath in the colder season it is also very suited for a bird feeder I read. It comes with a sturdy stainless steel hook and a chain that some mentioned as not to sturdy but that were only a few people.